Values are the building blocks and mortar that keep our entire civilization together. They are our priorities; in other words, they are those things that we put at the top of every list that we make, no matter what the subject. But we no longer seem to think that our values are worth defending. As I wrote several years ago in a book on higher education, “political correctness,” or “PC,” dominates the academy and the public square. PC advocates also tell us that truth really isn’t objective at all; it depends on our point of view. One person’s truth is supposed to be just as good (or, more to the point, just as unreliable) as another’s. What has been passed off as “truth” are merely the collective prejudices of the dominant ruling class and culture. We must be shown how to “deconstruct” what we think is true . Honor and virtue are increasingly rare commodities. Cheating and lying have become acceptable, especially in school, because our children believe that, with few exceptions, “everybody’s doing it.” Sadly, they may be right. In a 1995 article for Reader’s Digest, Daniel R. Levine notes that Who’s Who Among American High School Students polled more than three thousand high school juniors and seniors who were at the top of their class. Seventy-eight percent admitted cheating and 89 percent admitted cheating was common at their schools. We live in what may be the most cynical age in history—and the most gullible. For a long time, I thought that I was the only person who noticed this amazing contradiction, but in the last several years I have encountered a few writers who have pointed to it. We Americans are skeptical about many of the things we should believe, while we blindly accept many of the things we should question. On the one hand, we distrust politicians, journalists, and television and filmmakers because we know that they often have lied to us and deceived us, but, on the other hand, we still look to them as primary sources of information and as interpreters of reality. I don’t know the statistics, but I am willing to bet that there are now more laws and regulations on the books than there are people living in the United States. The state dictates how we should educate our children, earn our living, guard our health, take care of our communities, and even worship our God. The good news is that the vital role of the traditional family is at long last the subject of national attention. The breakdown of the family, rather than poverty, or race, or any other factor once cited by the liberal establishment, is now widely recognized as the real root cause of rising rates of substance abuse, teen suicide, abortion, academic failure, welfare dependency, and violent crime. Although millions of us still attend church and profess to believe in a Creator, we hold ourselves aloof from God. He is not, as He should be, the most important, guiding force in our daily lives. In one way, this is more shocking than if we had become atheists. Atheists deny God and His authority. We accept Him, but we refuse to take Him seriously. At school, at work, at social gatherings, and in public, we are too afraid, reluctant, or embarrassed—to even mention His name. Yet cheerfulness will keep breaking in. What a wonderful and wise sentiment! We would all do well to remember it; in fact, it would make a great title for another list—a list of what is right in America. Despite our troubles, we have many reasons to expect a bright future. There are literally millions of us who, for the most part, do defend our values, who do tell the truth, who do live honorably and virtuously, who do live up to high moral standards, who do exhibit trust, independence, and empathy, who do build strong families, and who are courageous witnesses to faith. For over two hundred years, we have found ways of overcoming adversity and succeeding against all odds. Though they may sometimes be threatened, our best qualities—optimism, resilience, moral imagination, ingenuity, charity, compassion, and spiritual strength—have a way of resurfacing when we need them most. Copyright © 2008 Hillsdale College. The opinions expressed in Imprimis are not necessarily the views of Hillsdale College. Reprinted by permission from Imprimis, a publication of Hillsdale College.” SUBSCRIPTION FREE UPON REQUEST. ISSN 0277-8432. Imprimis trademark registered in U.S. Patent and Trade Office #1563325. Former presidential candidate Mike Huckabee compared abortion to slavery during a speaking engagement at a recent pro-life event and received the curse of the N.A.A.C.P.. This is nothing new and one should tour our website to find “Amazing Experience” and also the director’s recent article in the Washington Times . One should also read the comments written by the present Director of Learn, Johnny Hunter (a Black Pro-Life Organization). As the National Director of L.E.A.R.N., Inc., I wish to express great joy for those of us who love life to share our information with you. We do not want our people to perish because of ignorance. Ignorance and apathy has hindered the proper response to the main destroyer of our future and the child. The single biggest threat to the survival of children, especially children of color, is imposed death by induced abortion. The African American community alone has lost over 12,000,000 people due to this most racist act. In the United States, over 36,000,000 human beings have been unjustly destroyed and the numbers are getting worse by the addition of over 4,000 more deaths each day. As a person who values human life, I feel very troubled that the youngest of our race is not guaranteed the opportunity to have their day in the sun. I have joined other Christians and have paid a very light price of time in jails and prisons for trying to save a little one. The destruction continues. Not long ago, I received a call from a woman who was setting up a Pro-Life women’s crisis center in town. She informed me that this clinic would be set up thirty yards away from the local abortion mill. The idea was to intercept women before they got to the clinic and offer them abortion alternatives. If they chose to go ahead with the abortion then we would offer our prayers and send them on their way, but at least they would be presented with a REAL choice, a real alternative. They would offer free pregnancy tests, 3D ultrasounds, and guidance. They would also storm heaven with prayers for all the babies and mothers, as well as the doctors and nurses at the clinic. This same set-up was envisioned about ten years ago in Little Rock, Arkansas by a local priest. He funded it all by himself and within five years the abortion clinic shut down. Due in large part to his efforts there are only two abortion clinics left in all of Arkansas. So when this woman contacted me asking if I would bless the clinic and possibly serve as a sort of chaplain to the center, of course I was happy to say I would do more than that! I offered to come celebrate Eucharist every Tuesday at 1:00 pm and be available for any other spiritual need they may require. They devoted a small room in the center that we converted into a chapel, and many people started to attend! We can have anywhere from four to ten people a week at Eucharist. We use the Anglican Missal and celebrate the Requiem Mass for the unborn. Many also quietly pray across the street from the clinic on Saturday mornings. 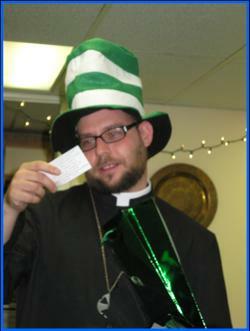 St Gabriel's was so fortunate to throw a St Patrick's fund raiser to help out the local Pro life center. We had a huge turn out and sold over 100 tickets! We started with a Eucharist and then went downstairs to celebrate! We had Traditional Irish Dancers, Bagpipes, Prizes and lots and lots of food! Newspapers covered the event and everyone ended up a winner! Especially the unborn. It was so beautiful to see all these different denominations come together for such a great cause, we had Anglicans, Antiochan Orthodox, Lutherans, Roman Catholics all having fun and fellowship. It was such an amazing event, smiles were everywhere, children played, and sang Irish tunes as we prayed for the day when abortion will one day be eliminated forever! May the Lord the Lord continue to bless us! See Father John’s different Beretta below…….. Sister Mary Magdalene took her perpetual profession vows on Passion Sunday, March 29, 2009. 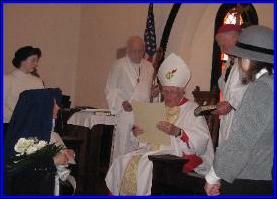 Her vows and veiling took place at Holy Redeemer Anglican Church, Montross, Virginia, where the Rt. Rev. Larry Wilson Johnson presided, assisted by The Ven. Dr. W. Ralph Gardiner OHI, of the Northern Neck, who serves as Rector at Holy Redeemer and is a leading priest in the continuing Anglican movement. Following the service, Bishop Johnson founded the Order of the Community of Compassion, the first for the Anglican Church of Virginia and perhaps the first in the history of Virginia since the Church’s establishment at Jamestown, Virginia in 1607. 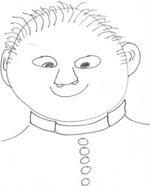 Find Father Anthony’s Ward’s new Blog dealing with Pro-Family issues. Father Antony Ward, BA, OHI, SSC.